It’s official – NSYNC will be making a special appearance alongside Ariana Grande during her set at the 2019 Coachella Music Festival! 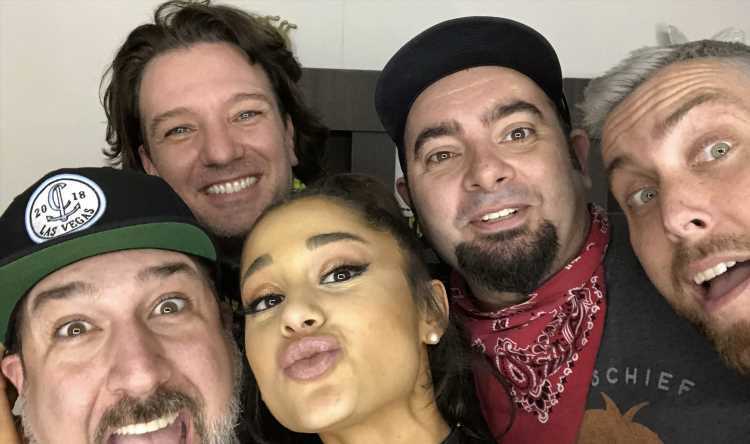 The group – minus Justin Timberlake – snapped a selfie with Ari ahead of the show on Sunday night (April 14) in Indio, Calif.
Joey Fatone, JC Chasez, Chris Kirkpatrick, and Lance Bass are all present for the big show while JT is on the east coast in New York City. Our sources spotted him tonight at sushi restaurant Sugarfish with Jessica Biel and other friends. He just wrapped his Man of the Woods tour on Saturday night. Coachella 2019 Lineup Revealed: Ariana Grande, Childish Gambino & More! Selena Gomez & Cardi B Give Surprise Coachella Performance During DJ Snake’s Set! Rosalía Proves She’s an Artist to Watch at Coachella 2019!